We celebrated Ainsley's 1st birthday on June 27th. We were so excited that my parents and my sister Tara, her husband Ben and my nephew Maddox were all able to make it! We had a wonderful time together. This visit was when we realized Ainsley might have a little trouble adjusting to her baby brother, Salter, who is due to arrive December 27th. As you can see from one of the pictures below, she wasn't too crazy about me holding Maddox unless I was also holding her. Floyd and Lisa got her a baby doll for her birthday and she does the same thing with the doll. She gets excited when she sees it and immediately wants me to hold it. She does not want to hold it or play by herself. She just wants me to have it, but only if she can crawl in my lap, and if I hug the doll she leans in to get a hug, too. The first time I tried to teach her how to take care of her baby doll, I rocked it in my arms and started singing to it and she started bawling crying. Not an angry cry, but the most pitiful heartbroken little cry, like "Mama, how could you sing to another baby!" She wouldn't stop until I hid the baby doll and held her for awhile! So I have a feeling we are in for it when we bring her baby brother home! Tara and her family and my parents got here a few days before Ainsley's birthday and my mom stayed a few extra days, which was wonderful. Maddox is the cutest little boy! 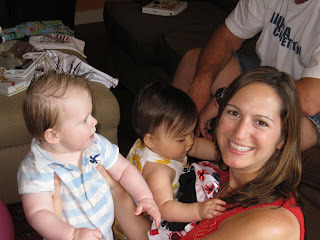 It is still amazing that he blonde with blue eyes when my sister is so dark - black hair and dark brown eyes! Maddox's dad Ben is in the Army and he and some of his buddies decided to try putting Maddox's hair in a mohawk one day. It worked, so we asked Tara to put it in a mohawk for us when we went to the Meltons for dinner. 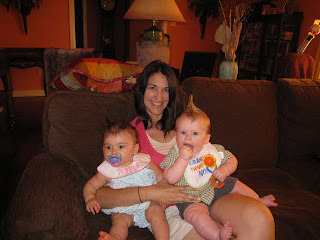 She even did Floyd IV's hair in a mohawk before the Stars and Stripes festival - wish I had a picture of that! 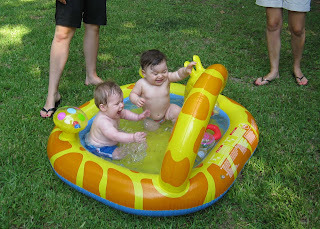 Anyway, we had so much fun together and loved seeing Ainsley and Maddox play together as well. It was only the second time we have been together since Maddox was born in November - Christmas was the first time we saw Maddox and he was only a month old, so he had REALLY changed since then! Hopefully we can all get together more often! 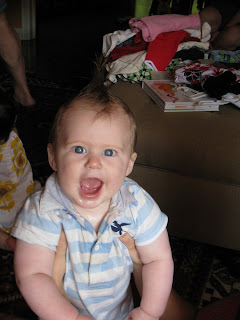 Sweet Maddox and his mohawk. Ainsley crawling in my lap while I'm holding Maddox.